About a month ago, educators at Billy Earl Dade Middle School in Dallas, Texas realized they had a problem on their hands. Some 150 students had signed up for the school’s first annual “Breakfast with Dads” event, but the organizers were afraid they wouldn’t have enough male mentors on hand. Proving that social media has the power to do incredible things, the school ended up with more than 600 volunteers after putting out a call on Facebook asking for just 50. As the Dallas Morning News reported, children’s advocate Kristina Chäadé Dove took to social media a week before the December 14 event, asking men in the community to give up an hour of their Thursday morning. The post subsequently went viral and an outpouring of responses came in. The event’s organizer, Rev. Donald Parish Jr. of True Lee Missionary Baptist Church, echoed Dove’s sentiments, telling the Dallas Morning News that the mere presence of a father figure could help put the students of the middle school—90 percent of whom come form low-income households—on the right path. Organizers received some 500 responses prior to the event, and when the day finally arrived, more than 600 men showed up to spend time with the boys. 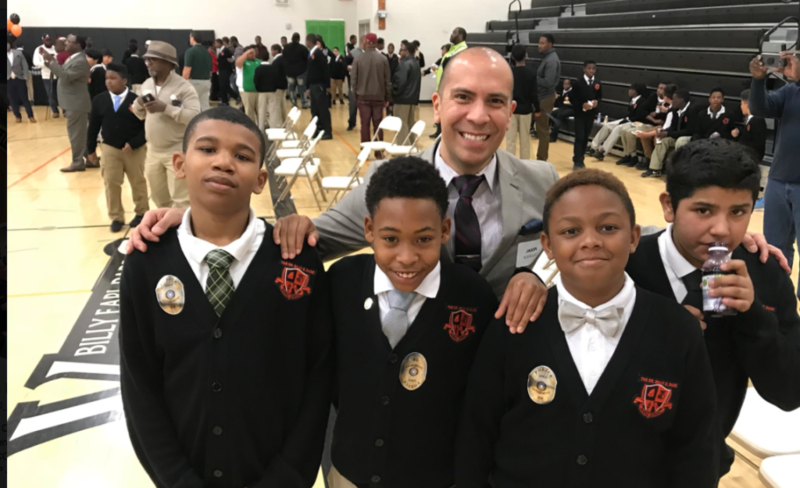 Jason Rodriguez, the assistant chief of police for the Dallas Independent School District Police Department, tweeted photos from the “powerful” morning and thanked the school for having him. The breakfast included icebreakers like learning how to tie and tie and one-on-one time for the students and their mentors to get to know each other. Drenka said the man behind the ties, Jamil “The Tie Man” Tucker, spoke of what an important milestone the seemingly mundane skill is for young men but many don’t have anyone to teach them how.